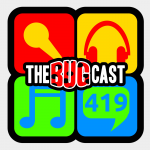 the bugcast 419 – Is this the world we created? This week on The Bugcast: we speak briefly on the situation in Munich, the lasting legacy of the format wars, and our usual 8 tracks of Creative Commons and independent music! The next live show will be episode 420, broadcast live in the chatroom on Friday 29 July 2016 at 21:30 UK time (BST/GDT/UTC+1). the bugcast 419 - Is this the world we created?